See the missions that MPL has successfully supported. The Mission Planning Lab (MPL) provides a collaborative visualization and analysis tool that allows realistic simulation, presentation and evaluation of platform selection, flight profiles, and range asset placement. 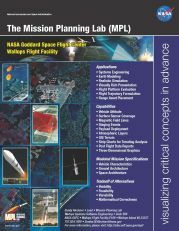 By integrating detailed information on vehicle capabilities, range capabilities, and mission specific objectives, MPL meets several critical current needs for the Wallops Research Range. MPL now supports real-time capability. Integrate Mission Design Trades with existing/proposed capabilities. Baseline assumptions and performance goals. Assess and validate assumptions and goals. Compare and analyze performance with planned asset configuration. Scenarios generated can exercise Safety and Operations personnel. Educate university students (future workforce).